In recent years Andy McCluskey has been very frank about the vicious treadmill of commerce keeping the band in a tight pattern of write/record/tour to the point where there was insufficient time for pausing and reflecting on exactly what you might want to write about. After five years they had worked through the themes that they had nursed growing up. Let’s not forget that it was writer’s block desperation for new material in the aftermath of the massive “Architecture + Morality” campaign that inadvertently led to the “Dazzle Ships” album that had increased the pressure the band was working under. That their audience shrank dramatically in its wake, coupled with the desire to “crack America” would be a double edged sword slicing away at the band. The first signs of the pressures the band was under surfaced publicly as early as the 1985 UK Crush tour program. Andy McCluskey was very frank [as is his nature] about the difficulty that the wheel of commerce caused the group specifically in the writing part of the equation. Notice that he hoped that the touring itself would serve to spark the kindling of song ideas. But the opening up of the American market [to the extent that it did] served to cause its own issues, which further impacted the band’s writing. OMD’s plan for their world tour in support of the “Crush” album was printed in the UK tour program, as seen above. Because of the ignition of “So In Love” on the US charts in the Summer of 1985, the band found themselves touring heavily in The States in July-August of that year, with a run of 22 dates opening up for The Power Station. Maybe some of you remember The Power Station? The Duran Duran/Robert Palmer/Chic supergroup who netted exactly two hit singles in 1985? They got “Some Like It Hot” and a turgid cover of “Get It On [Bang A Gong]” into the US top ten probably on the value of John Taylor’s cheekbones and DD’s less discriminating fan following. Singer Robert Palmer bowed out of the tour, citing priority for his own album he was recording during that time. This left the band scrambling for a replacement since this tour was cocaine to be inhaled money to be printed. 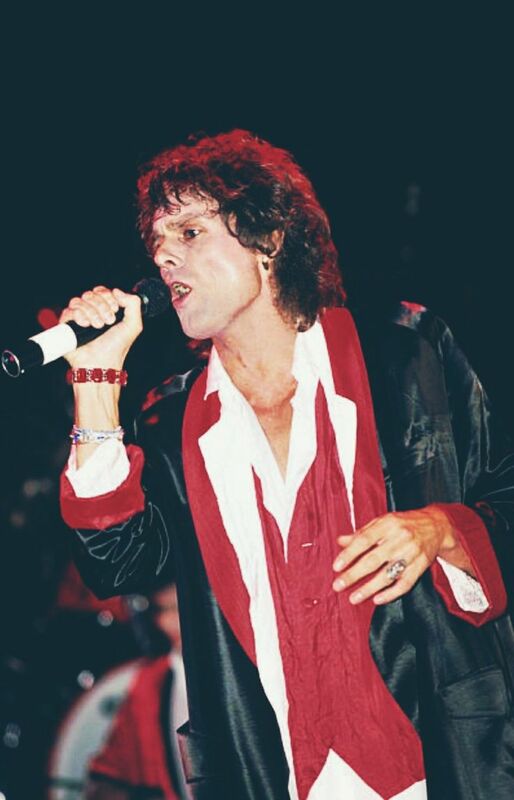 They eventually settled for glam-come-lately singer Michael [“Silverhead”] DesBarres to sing for the tour. They were playing mostly medium to large arenas seating 2-20,000 screaming fans. They picked OMD for the July-August two month leg of it. OMD were also headlining some peripheral dates of their own, with venues at about a tenth of the capacity of those that The Power Station were pulling. Thanks to the magic power of The Taylors and two top ten singles. That must have hurt. So when the second legs of their UK/European tour [during the all-important Christmas concert season] were supposed to have happened, OMD found themselves trucking all across America again, this time opening up for the Thompson Twins. The latter band were milking their 15 minutes in the commercial sun for all it was worth; which wasn’t much to me by then. I had been an early convert to The Thompson Twins with their “In The Name Of Love” album [a.k.a. “Set”] being a 1982 favorite but subsequently got off of their bus after the tepid MOR of “Into The Gap” showed me how it was going to be for them after the divisive MOR of “Hold Me Now” made them huge American stars. And this time the Thompson Twins were coming within striking distance of where I lived. No matter how lax the “Crush ” album had been, I could hardly believe that I might finally get the chance to see one of my favorite groups for the last five years. I had to make it happen. This entry was posted in Core Collection, Live Music, Mid-80s Malaise, Rock GPA and tagged 1985, Crush, OMD, Power Station, Thompson Twins, Tour. Bookmark the permalink. I remember hanging out with my girlfriend on the day that OMD were opening for Power Station. Seeing OMD was an exciting prospect indeed, and as late as 4:00 or 5:00 pm we were debating going to the show. But even as DD fans, we thought PS was pretty lame and didn’t want to spend the cash to see OMD play for 45 minutes in the lousy setting of a huge arena. But the OMD/Thompson Twins bill did draw us in (at the time, we liked Side Kicks, Set, and A Product Of… enough that we were hoping that the bland Into the Gap was a slump). I have to admit that both bands really delivered and it was a hell of a show. Saw OMD headline twice after that – both circa 1986/1987 – and they really brought the energy, even if their newer material was lacking. JT – I never saw Thompson Twins either time I saw OMD open up for them [admittedly, I’m getting ahead of myself here…]. In both cases, the gang of four [except for me, completely different people] came to a decision to leave about 3-4 songs in. I can’t remember who among us proposed it, but it felt okay at the time. I did buy a ßeta video of the “Side Kicks Live” concert in the new millennium to DVD and see what I missed back in 1983 when they played in Daytona Beach during spring break and I found out about it afterward. Then again, missing unruly spring break crowds was probably worth it! Interesting that you saw OMD on the “Pacific Age” era when they were m.i.a. in the South. The blackout of OMD US tours for me that covered “Pacific Age” and the entire Andy-only era is something I probably would have investigated [possibly to my detriment] had been given a chance. I tend to agree with Jordan although qualify it to they found it easier to write top 40 geared pop stuff, and then when the associated success (er money) from that came through it was hard to get off of the train until their audience got bored and hey look a new Howard Jones album! By the 90’s they’re namechecking Christy Canyon in songs for crying out loud. If you think about it, by the time they got their moment in the states a lot of their new wave contemporary’s careers had pretty much tanked. You want the gold discs and the money? NOW is the time. I rather like a couple of their singles but nothing from either the arty farty early years or on the John Hughes later years (for the 80’s) ever left me compelled to listen to it again and again and again. There’s loads of 80s stuff I’d rather listen to but if they’re in the mix or the playlist well, I generally don’t mind. I look forward to hearing your comments about that concert. I saw that tour as well. I went not for the Twins ( though they had a few decent songs ) but for OMD even if it was as a support act. But I cannot remember the show. You cannot overstate the balance an act has to pull off when they achieve a bit of success with money versus creativity. Suddenly. Managers. Labels. Tour personnel all have to be paid. An act has to be paid as well. They get used to the high life. They start to create MOR. A band like Depeche Mode seemed to avoid that. They kept on releasing stunning music as they got larger and larger. Until after Exciter or Ultra. Voices. I cannot listen to Radiohead specifically because of Thom Yorkes’ voice. Drives me crazy. Morrissey. You know what your getting. And I like it. Andy is well known for trotting out the old line. We broke America and America broke us , at any opportunity. I think in many ways the band broke themselves. But I will always enjoy highly the first 3-4 albums they did. Still listen to them. Jordan – I could never rate Depeche Mode all that highly; perhaps because of that poor [in my view] debut album. They were always second synthpop tier for me. True, I did buy basically everything from 1981-1990 but after that I stopped and didn’t miss them. It did rankle me that I never got to see them until the World Violation tour where they filled the 18,000 seat Orlando Arena. That was a great album; no question, but by that time, ten years of fandom and support from people in backwater Orlando, Florida meant that we only saw them live when it was a safe, foregone conclusion. Thanks, heaps. I actually was more interested in seeing Nitzer Ebb open at that point, and I’d even caught them in a local club on the “Belief” tour a couple of years earlier. I don’t regret buying any of those Depeche Mode rarities though. I have since sold them to Germans at some tidy profit. Was there ever a point where I listened to Depeche Mode as extensively as Ultravox, John Foxx, Simple Minds, or OMD? Not quite. They didn’t connect as strongly with me. They were a little heavy on the teen angst, which didn’t speak to me. But it makes sense that they would grow their audience to arena size with that foundation in their sound. I’m with you on the low opinion of Speak and Spell, which I attribute mostly to the influence of Vince Clark. I am equally cold to his work immediately there after as Yazoo, the Assembly and the first Erasure album. DM from that point through Violator easily commercially distill a lot of the 80’s. While your Duran Duran or Wham may have been more about the party DM covers pretty much the rest, there’s a certain je ne sais quoi about their work, especially the early part of this period, that captures a vibe of the Cold War, there’s religion, there’s their trademark perviness, some teen ennui and the combo works well. I knew folks who hated them and I knew folks who loved them, up until Violator I didn’t know anyone who you would call a casual listener. There’s a lot of 80’s music that I bought like mad and there’s some that has been totally sold off and I look back at my fandom of those acts as kind of quaintly embarrassing. I don’t ever feel that way about DM, to me their music is almost a sonic time capsule that if anything does an excellent job of distilling the Reagan Bush decade to a sonic feeling. The comment thread here is nestled in an OMD GPA, to me OMD is the soundtrack to the John Hughes feel good reinforcement of a Ferris Bueller status quo, Depeche Mode is probably the most commercial thing that you might hear Otto from Repo Man grooving to. I think that the DM formula is long worn out but when they did what they did best – as a commercially successful act trawling the waters they did – they’re my go to for that kind of 80’s sound. So I saw OMD early on – 82/84 3 times and each one of those shows was an ecstatic experience. Then 85 came along and I was less enamored of the music, but this was a foundation band of my New Wave/Post Punk experience…I had to see them. I DIDN’T have to see Thompson Twins who lost me after Set and Power Station were so bland and unnecessary and uninspired that they named themselves after the coke den, excuse me, recording studio the spent so much time in. If I wanted to see any of those musicians, I just needed to show up for work at The Limelight where Joe Leeway, Alannah Currie and a much more boisterous than you would ever believe Tom Bailey spent many, many nights. Andy and John and Tony Thompson also spent many night hours in the Library at Limelight living loud and large. But I digress…by the time OMD came back a few years later, opening for Depeche Mode, I was pretty much done. My friends and I attempted to make it to Jones Beach Theatre in rush hour traffic to see OMD, but the final strains of Electricity were playing as we got out of the car and ran to the venue…none of us were really all that disappointed. Echorich – Which NYC clubs did OMD play early on? Those early tours were where Andy and Paul met their American wives, who worked in the clubs and got to put up the members when there was no budget for lodging. Tom Bailey… boisterous? That seems hard to believe. He was always such a mopy frontman but I guess he had to let Alannah and Joe carry the live show. So there was this Long Island dinner theater they played, it had some very wannabe toney name…and they played The Savoy, one of my favorite venues at the time in Times Square the week before. There was, of course The Ritz gig in 84, but they played and even more obscure club in Long Island the night before that a friend of mine was bartending at. I was reminded of the Savoy club today by my friend Patty who was ALWAYS by my side when concert going in those days, so I guess I saw them 4 times in that period. Echorich – So while the Southeast was stewing in its juices and had to wait basically until all New Wave bands sucked before they’d deign to perform down there, bands like OMD were double-dipping in the NYC market? Crazy! That makes me wanna do a Simon LeBon… even 35 years later!